Very often the Elizabethan era is referred to as the ‘Golden Age’ as far as English history is concerned. One of the major reasons for the same being that music along with literature and fashion flourished during this period. Just to emphasize the importance of music during this era, it was a common belief that a man, who was unable to win the hearts of others when he sang, was not considered to be a gentleman. Such was the importance of music. Queen Elizabeth, herself, was a connoisseur of music and could play lute or virginal. The virginal was a ‘tiny piano.’ It was this love for music which gave tremendous encouragement to the musicians of her era to prove their talent. Queen Elizabeth hired as many as 70 musicians to perform in her court. Soon after, music found a significant place in theatre as well. This was clearly evident in the plays of William Shakespeare which used music as a means of expressing various emotions. This gave a tremendous boost to theatre music as well. The music during the Elizabeth era was known for its rhythm. Broadly speaking, music of that time could be categorized into – church music, court music, street music, theatre music and town music. 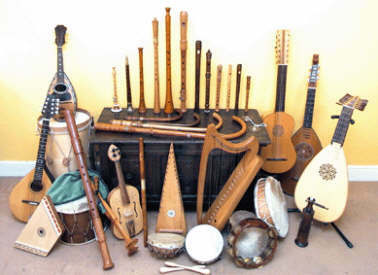 The musical instruments of that time were the string, keyboard, wind and percussion. The use of different musical instruments signified the status of men for example trumpets indicated royalty and so on. Out of all the songs composed during this era, ‘Greensleeves’ was the most amous one which was accredited to King Henry VIII who was believed to have composed the song for his second wife Anne Boleyn though there is no proof of his authorship to this work. Another famous song was the ‘Now is the month of Maying’ composed by Thomas Morley. Thomas Morley composed music for the Church of England and was employed at the St Paul’s in London. William Byrd was Queen Elizabeth’s favorite composer. He, along with Thomas Tallis were granted exclusive license by Queen Elizabeth to print and publish music. ‘This Sweet and Merry Month of May’ was a very famous madrigal composed in the honor of Queen Elizabeth by them. This resulted in the remarkable growth of music during the Elizabethan era.